National Law University (NLU) Assam Recruitment 2018 | Walk in for Faculty Positions,NLUJA July Recruitment :- Hello dear job aspirants. Those who have completed Law Degree , have some good news. The National Law University (NLU) Assam has recently issued a Recruitment notification in the month of July 2018 for various faculty positions. 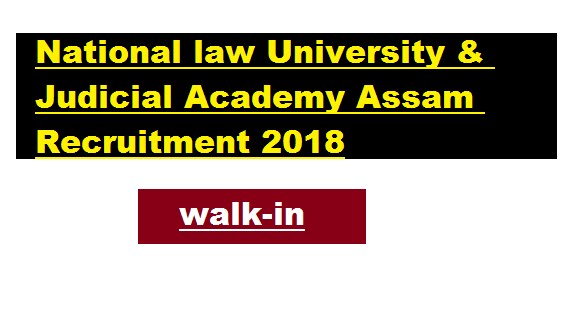 According to the latest NLU Assam Recruitment 2018 , A walk in interview will be held on 30/07/2018 , from 11:00 A.M to 2:00 PM at national Law University & Judicial Academy , Amingaon Assam, for filling up the posts of Faculty Member , Research Associates & Research Assistants. We have discussed about NLU Assam Recruitment in below section. In this section, we will discuss in detail about Recruitment of various teaching posts under Naional Law University Assam Recruitment 2018 with all the details and requirement. Educational Qualification : Candidates must have Master Degree in law with at least 55% ( 5096 marks for SC/ST candidates) or an equivalent grade in a point scale wherever grading system is followed from an Indian University or an equivalent degree from an accredited foreign university. 1. Appointment will be made on purely temporary basis. The university reserves the exclusive right to reject applications/terminate service of the incumbent at any point without citing any reason whatsoever. 2. Number of posts is tentative, may vary and the university reserves the right to increase or decrease number of posts and may or may not fill any post(s)and its decision in this regard shall be final. 4. In case of any inadvertent mistake in the process of selection which may be detected at any stage even after the issue of appointment letter, the university reserves the right to modify / withdraw / cancel any communication made to the candidate. 6. Candidates are advised to produce original testimonials and photocopies of the same at the time of Walk-in-Interview.